I first attempted to order AirPods from AT&T’s online store after I discovered that they were listed as in stock and ready to ship. Unfortunately, America’s second largest cellular carrier isn’t capable of keeping their own website’s inventory levels up to date. I received an email the following day informing me that the AirPods I had ordered were no longer available. What a joke. At the time, Apple was claiming a six week wait time for AirPods — which they still are. But I was hoping to catch a break and get them sooner by ordering from someone else. After the failed attempt at purchasing them from AT&T and a few days scouring the internet for leads, I gave up and purchased them from the source. Trying to get them early was proving to be a time consuming affair, filled with dead ends and empty promises. Without spending every waking hour monitoring inventory websites, it just wasn’t going to happen. I placed my order on March 2 and waited two days shy of the six week mark for my AirPods to arrive. I hadn’t been this excited about a new gadget since I purchased my Apple Watch in fall 2015. But could the AirPods possibly live up to the hype? My friends who had already purchased a pair were over the moon about them and I had seen discussions on Twitter about them being “the best Apple product since the iPad”. That’s hefty praise for a pair of wireless headphones. When I came home from work on delivery day, I had a brown cardboard package waiting for me on the dining room table. I cut open the tape and found a small white box with a beautiful image of AirPods embossed on the front. Unwrapping a new gadget is always an enjoyable experience, but I find myself especially excited when there’s an Apple logo on the box. 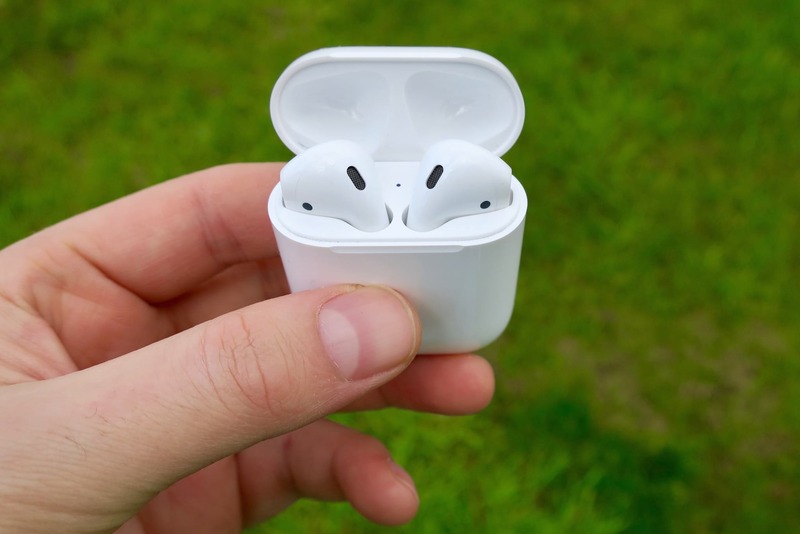 I couldn’t wait to rip off the outer plastic, slip off the lid, and see if the AirPods were really as great as everyone was saying they were. 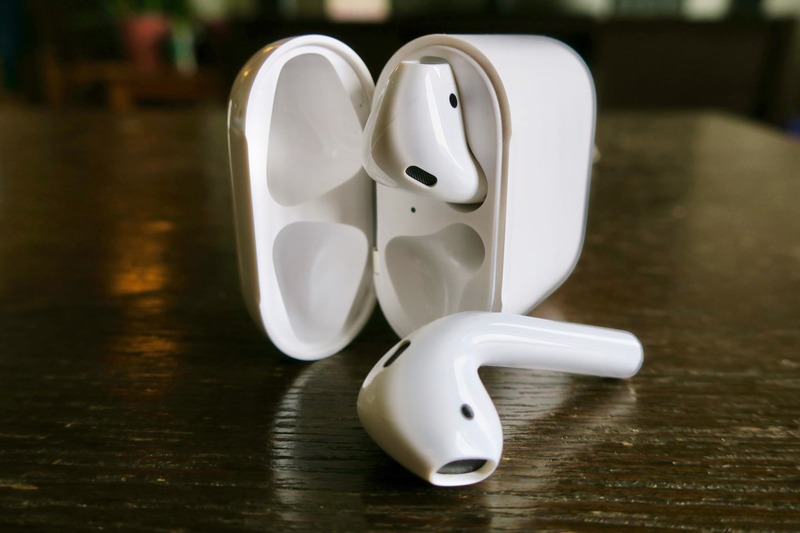 When I first saw the AirPods in Apple’s product shots, I thought they looked a little odd. I mean, they’re just hanging out of the side of your head — like you got interrupted while cleaning your ears and forgot to finish the job. But I suppose, truthfully, people look a little weird wearing wired earbuds too, we’ve just grown accustomed to it. I think we’ll reach that point with wireless headphones, it’s just going to take some time. There’s not too much to say about the earbuds themselves, from a design perspective. They look just like Apple’s EarPods with the cables cut off. The stem is a smidge thicker, but its barely noticeable unless you have them right next to one another. Coming from someone who’s spent the past thirteen years using whatever headphones Apple included in the box — iPhone or iPod — I find the AirPods to be very comfortable in my ears. They never feel like they’re going to fall out and I haven’t found them to be irritating during long listening sessions. But of course, you’re mileage may vary. Whether or not you find them comfortable is entirely dependent on how they fit in your uniquely-shaped ears. My impression is that they’ll be fine for most, but if you don’t like how EarPods feel, AirPods might not be for you. The real design genius is in the case. A small, white plastic charging pod that houses your AirPods when they’re not in use. It has a Lightning port on the bottom, for charging, and a hinged lid at the top. I often find myself mindlessly opening and closing the lid just to hear the satisfying snap of the magnets pulling the case shut. The rear of the case has a small circular button for manually pairing the AirPods. In regular use, this will be infrequently needed. At least for me. The vast majority of the time, I’m connecting my AirPods to devices associated with my iCloud account. I have used them with my Apple TV for testing and they worked great. But I don’t expect it will become a regular occurrence. Under the lid, the case features an AirPod shaped hole for each of your earbuds and an LED that indicates the current battery charge. If your AirPods are in the case, the light shows the charge status of your AirPods. If not, the light shows the charge status of the case. This is a great, intuitive little detail that just feels brilliant. My only real complaint about the AirPods’ design is the size of the case. I wish it was a little bit smaller. I wouldn’t mind sacrificing a portion of the case’s battery life if they fit more comfortably in my pocket. This is a minor annoyance — something I can absolutely live with and won’t impact my willingness to recommend them to others. But if Apple could shrink the case, even by only a few millimeters, I’d be ecstatic. Apple’s control over the operating system gives them an incredible advantage when it comes to pairing their own brand of wireless headphones with iOS. The AirPods’ pairing process is the fastest and easiest I’ve ever seen. Just pop open the case’s lid with your iPhone unlocked and you’ll be greeted with a beautiful pairing prompt. Once you’ve tapped “connect” you’re done. 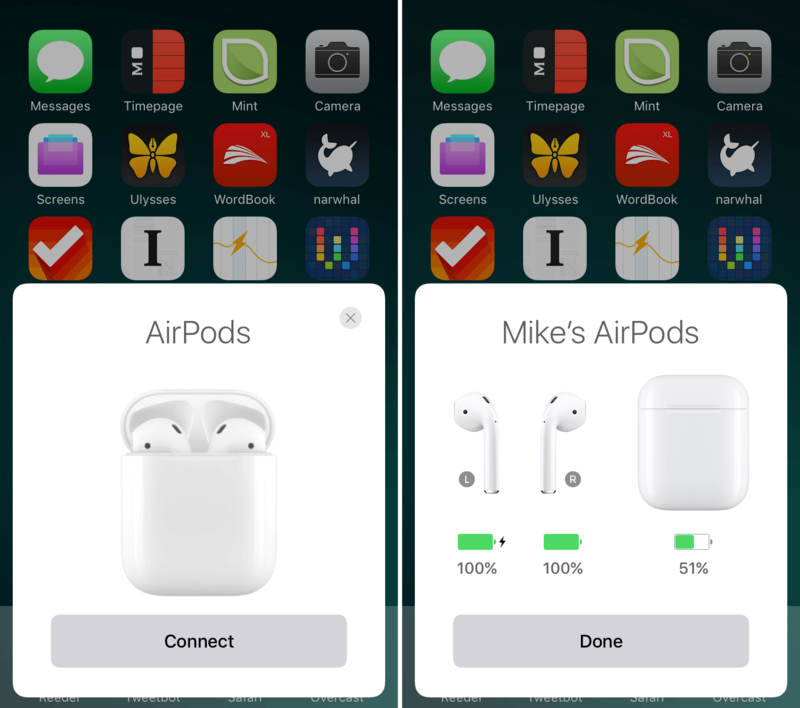 After the initial setup, AirPods aren’t just connected to your iPhone — every device that’s associated with your iCloud account is able to choose your AirPods as their sound output. This switching feature is significantly better than anything else on the market, but it still isn’t quite as seamless as I was expecting. Perhaps I was confused by Apple’s messaging, but I thought AirPods would automatically pair with whatever device was playing audio. Unfortunately, that’s not the case. 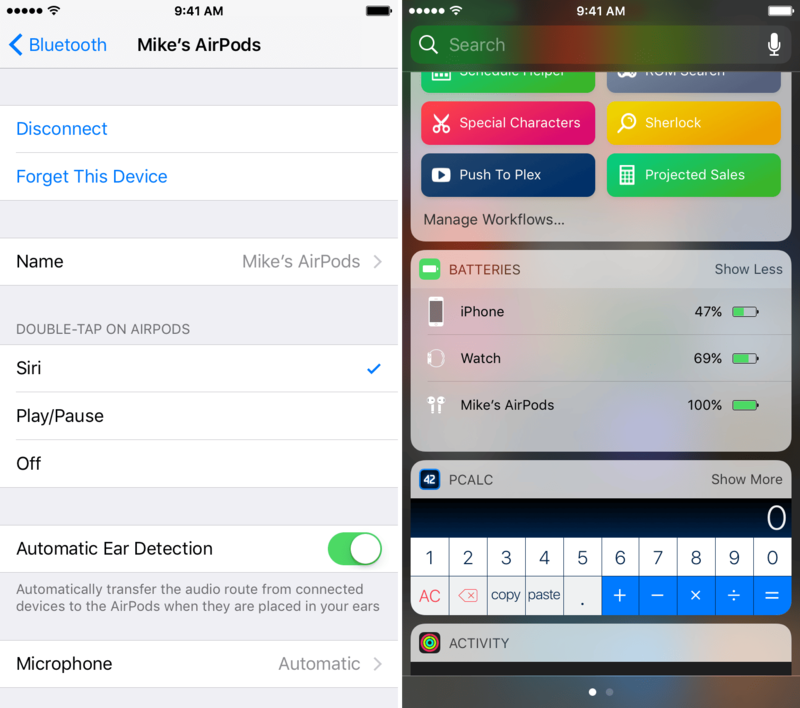 Whenever you want to switch to another device, you have to select your AirPods in Control Center or the audio drop down menu in macOS. That’s much nicer than having to hold down the pairing button on the headphones, jump into Bluetooth settings, and choose them from the list. But I wish Apple could have come up with some way for AirPods to automatically switch inputs based on what device is playing audio. Or, at the very least, have them auto-pair with whatever device you’re currently using rather than the device they were last connected to. Ever since receiving the AirPods, I’ve used them to listen to podcasts on my lunch break. When I get home, I usually sit on the couch or at the dining room table with my iPad, browsing Twitter, reading the news, or doing a bit of writing. If I open the AirPods case and place the earbuds in my ears, why do they connect to my iPhone? A device that, at that moment, is either in my pocket or face down on the table. It just seems nonsensical. Maybe we’re still a few years away from this capability. But with how elegant the AirPods are at pairing and switching, it would be nice if Apple could eliminate the need to explicitly tell my iPad to output its audio through my AirPods. It doesn’t matter what they were last connected to, these products should be able to communicate with one another over Continuity and make an informed decision about which device the AirPods should play audio from. Hopefully the folks at Apple have this planned for the future. I have two simple words that accurately describe my opinion of the AirPods’ sound quality: perfectly acceptable. It’s not fair to compare them to other headphones in the same price range because they aren’t competing on the same axis. AirPods are designed around ease of use-first rather than sound-quality-first — it’s all about pairing, switching between devices, and the intuitive gestures. That doesn’t mean that they sound terrible. In fact, quite the contrary, I think they sound downright good. But if you’re enthusiastic about audio fidelity, you probably already own a nice pair of headphones that you purchased with that in mind. Does that mean you should skip the AirPods? Possibly. But, it depends on how much money you have to burn and whether or not you feel there’s room in your life for another set of headphones. In an imaginary scenario in which I care much more deeply about sound quality than I currently do, I expect I’d own two sets of headphones. An expensive, wired set that’s designed to isolate my hearing from noisy surroundings and, of course, AirPods. This combination would give me the best sound quality possible while I’m at home and incredible portability and convenience when I’m out of the house. It’s an expensive setup, but if I’ve learned anything from audiophiles, it’s that they aren’t afraid to spend a little too much on gear. But again, I’m not an audiophile. As I mentioned earlier, the only headphones I’ve used in the past thirteen years are the ones that were included in the box alongside my iPhone or iPod. EarPods sound just fine to me and AirPods are no different. I’ve had my AirPods for about a month, but I haven’t actually spent much time using Siri with them. I’m not someone who uses his voice to interact with his gadgets very often. There’s an occasional “hey Siri, what’s the weather outside” while I’m getting ready for work, but more often than not, I have a device close enough that using the touch screen is just faster. At first, I made a concerted effort to use voice controls on my AirPods as often as I could. Double tapping the earbud with my finger has worked with near-perfect accuracy, but its a little bit slower than I’d like. That short, two or three second pause doesn’t sound like much, but in practice, it gets irritating quickly. I’m sure I would find more utility in Siri through my AirPods if I was in a setting where taking out my phone could be hazardous — near water, out for a run, etc. But I’ve slowly settled into only using Siri on my AirPods when I’ve left my iPhone in another room. And even then, I’d rather use my Watch to perform the function, if I’m wearing it. The biggest downside with AirPods is their lack of physical controls. Apple is offering the two-tap Siri gesture to try and mitigate the complaint, but we all know how the voice-only interface worked out with the third-generation iPod Shuffle. Unless Siri gets a lot faster, I think Apple will eventually have to add more controls to AirPods. I suppose they could add a three-tap gesture, but I’m not sure if that’s the path Apple wants to take. Interactions could get awfully confusing if they take tap gestures any further than they already have. Aside from the double-tap, Apple only offers one other “gesture” on the AirPods — physically removing an AirPod from your ear. 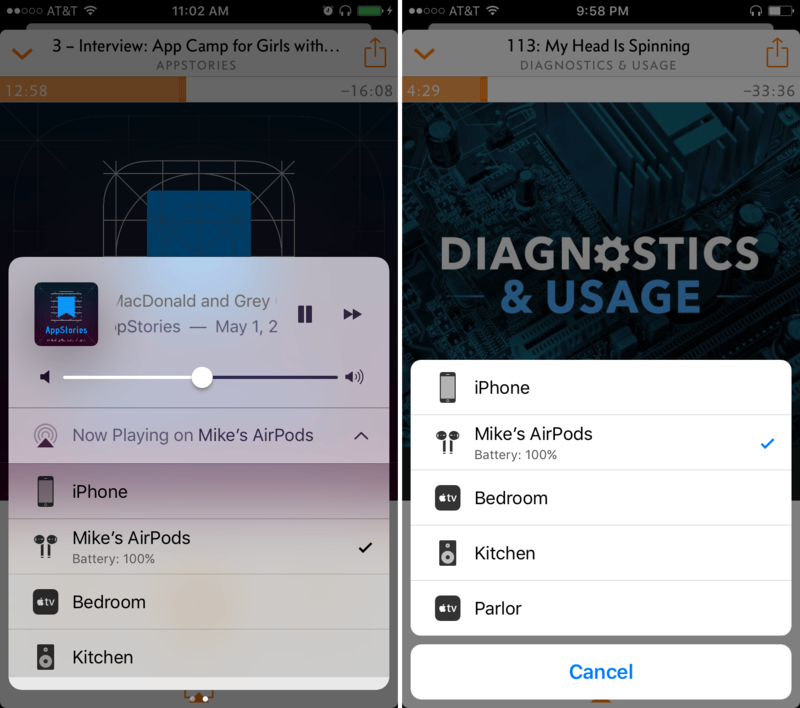 By default, this pauses media playback that automatically resumes when the AirPod is returned. This is an intuitive and natural way to handle this problem — even when I used wired headphones, I would often remove a single earbud when someone was trying to get my attention. The audio wouldn’t stop in this case, but it gave me a free ear for listening. Apple’s implementation of this works very well and I only have one minor complaint about it. Sometimes you hold the removed AirPod in such a way that the earbud thinks it has returned to your ear and resumes playback. Over time this has occurred less often, as I’ve learned what triggers it, but it’s something to keep in mind for the first few weeks of ownership. I was a bit concerned about battery life when Apple first announced the AirPods. At the time, my day job required me to work one late-night shift each week. The upside being that I could wear headphones and listen to music or podcasts for most of my shift — about five hours, exactly the claimed battery life for the AirPods themselves. I was worried that, once the battery had gone through a few dozen recharge cycles, it wouldn’t last me the full five hours. Luckily, those shifts ended for me at the beginning of the year and I no longer have such large spans of uninterrupted time for audio listening. In my four weeks with the AirPods, I’ve only had one low battery situation. It was my first full day off after their delivery and I wore them from the time I woke up until the battery started getting low in the early afternoon. This usage isn’t anything I’d consider to be normal, though. I was excited about a new gadget — in that mode where you take every opportunity to use it, even just to fiddle with the case’s lid and see the pairing pop-up on your iPhone. Now that my usage has settled down a bit, my longest continuous listening sessions are only a few hours. Battery life isn’t an issue at all. Especially with the AirPods’ brilliant charging case, which contains a battery that adds about 24 hours of listening time. In practice, if the AirPods aren’t in my ears, they’re in the case. And because of this natural habit, I don’t even pay attention to the AirPods’ battery anymore. I just plug the case into a Lightning cable every few days and they always have an adequate charge. 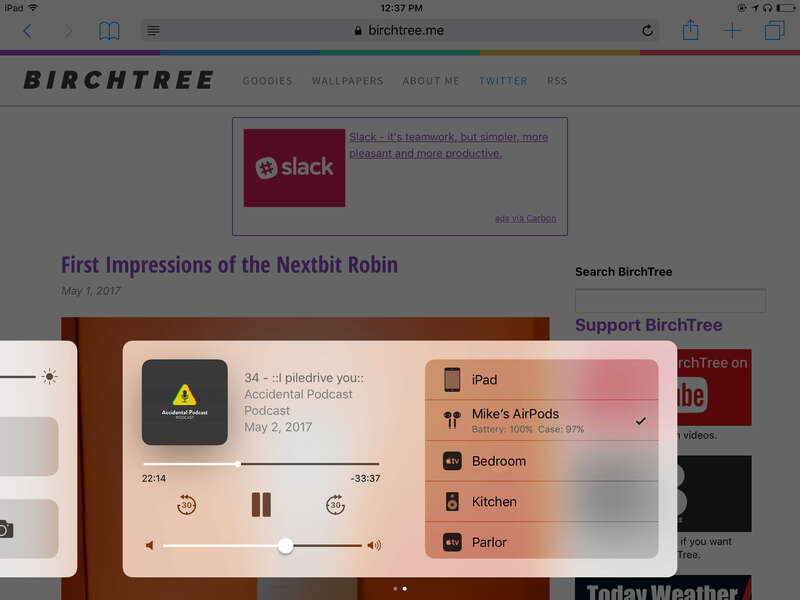 I did discover a neat trick during that low battery incident that can help you continue listening well beyond the five hours with minimal interruption. Perhaps most AirPod owners have already realized this, but I think it’s an important point to make for anyone thinking about buying a pair. When your AirPods’ batteries are low, put one AirPod in the case to charge and continue playback with the other. After about fifteen minutes, swap them. After another fifteen minutes, continue playback as normal. Fifteen minutes inside the case gets you another three hours of playback. Doing this “swapping dance” will allow you to extend the AirPods’ battery life until the case’s reserves have been depleted with just a half-hour of less-than-optimal listening every three hours — listening with just a single earbud instead of both. I don’t expect I’ll use this trick often, but when I do, it’ll be a life saver. The hype was indeed warranted with the AirPods. Apple made a big bet on wireless with the launch of the iPhone 7 and these incredibly intuitive Bluetooth headphones were the payoff. I can’t imagine going back to wired EarPods now. Catching the wire on various objects throughout the house and dealing with a tangled mess every time I want to use them — I’m glad to have those days behind me. As for the AirPods being the best new Apple product since the iPad? I think they are. The only product that comes close is the Apple Watch. And although I wear mine every day, it doesn’t have the same fit and finish of the AirPods. The Watch’s relatively complicated functionality doesn’t help the equation much, but I find the AirPods to be much better at their primary function than the Watch. When I want to listen to audio, the AirPods work, every single time. Even two years after launch, the Watch still has the occasional hiccup when I raise my wrist to see the time. The AirPods also do a better job at delivering on the promise of wireless headphones than the Watch does at delivering a smartwatch experience. 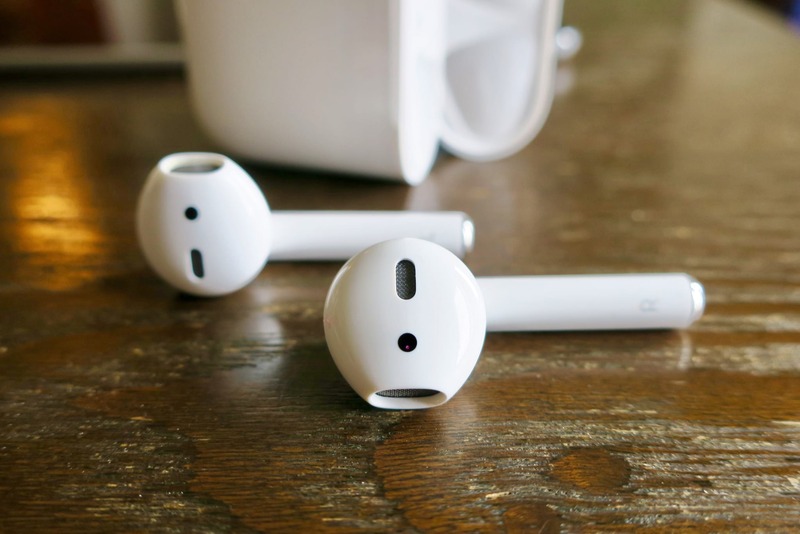 The AirPods have very few annoyances and none of them hurt the experience in a major way. Whereas the Apple Watch is filled with oddities — unreliable complication refreshes, unexpectedly slow app launch times, and instances where my Watch just doesn’t tap me for a notification. Don’t get me wrong, I love my Watch. I wouldn’t wear it everyday if that wasn’t the case. But the AirPods remind me of why I started using Apple products in the first place — everything feels intuitive and there’s so many little details that contribute to an unparalleled user experience. It’s the kind of product that has you immediately forgetting about the infuriating six week wait time. AirPods are the closest thing to a perfect product that we’ve seen from Apple in many years. And this is only their first attempt at wireless headphones. It’s almost unbelievable that they were able to build such a polished offering out of the gate like this. If the AirPods are representative of Apple’s idea for a wireless future, I think we’ll be seeing great things ahead.